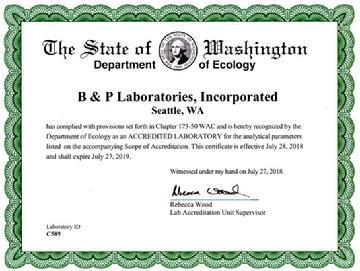 Serving the Seattle area for more than 45 years, B&P Laboratories, Inc. is a full-service analytical testing laboratory. We're certified by the State of Washington Department of Ecology for a wide range of water, solution, metallurgical, organic, and compound testing, and we offer a range of services to help your business maintain compliance with changing standards. B&P Labs was founded on a single goal: to meet the needs of our local community. Our experienced lab techs are dedicated to providing quality service. Contact us to learn how we can help make sure your products and solutions comply with Washington State standards and keep your business running at peak efficiency. At B&P Labs, our goal is to keep your products up-to-date with the latest Washington State regulations and to provide you with the tools and information you need to operate efficiently. B&P has the experience, training, and equipment to provide the fast, accurate laboratory services your business needs. We offer a wide range of services tailored to our clients’ needs, and our master recall system helps our clients maintain quality control and assurance throughout the year. ...dedicated to solving your problems and helping you maintain quality in your products. We have partnered with Seattle companies for the last four decades to insure that their solutions, water and products are compliant with Washington State standards. Department of Ecology Certified - C 589. We are in the process to obtain Nadcap Certification.